Seattle Reign FC secured second place in the standings after defeating the Houston Dash 3-1 in the Week 15 finale. Jodie Taylor, Megan Rapinoe and Allie Long scored for the Reign, while Amber Books scored for the Dash. Reign FC are now 7-3-5 on the year with 26 points and the Dash are in seventh place at 4-5-5 and 17 points. Defender Amber Brooks scored the game’s opening goal in the 12th minute. The defender is second in the league in interceptions, but found herself in a scoring opportunity when she finished with her head off of a Sofia Huerta corner kick. In addition to scoring her first goal of the season, Brooks also finished the game stellar defensively, making five tackles, nine clearances, six interceptions and one block. The home team equalized before the half when Rapinoe took a quick throw in transition and found Taylor running at the Dash backline. Taylor chipped Campbell to make it all even at the 37th minute. At the first 45 the Reign had the better of the possession at 65.5% to the Dash’s 34.5%. The second half kicked off with the Reign dictating the play. Rumi Utsugi and Elizabeth Addo both added to the attack along with Pinoe and Taylor continuing to push for the go-ahead goal. In the 55th minute Addo drew a foul in the penalty area. Rapine took the penalty kick and buried it to make it 2-1 Seattle and score her sixth goal of the season. The Reign sealed the deal in the 85th minute when Rapinoe and midfielder Allie Long combined for a give-and-go. Long played Rapinoe and Rapinoe found Long again in behind the Dash backline. Long finished her third goal of the season to make it 3-1 and Rapinoe picked up her second assist of the night (fourth of the season). Rapinoe finished the game with three shots (two on target) and five key passes on the night. She also had a game-high 90 touches. Dash goalkeeper Jane Campbell earned four saves on the night, and Reign FC goalkeeper Lydia Williams got the win in net with three saves. The Reign will next play Wednesday in a Week 16 clash vs. Utah Royals FC and the Dash will also play midweek when they host the Orlando Pride. Match ends, Seattle Reign 3, Houston Dash 1. Second Half ends, Seattle Reign 3, Houston Dash 1. Attempt missed. Clare Polkinghorne (Houston Dash) header from the centre of the box misses to the right. Assisted by Sofia Huerta with a cross. Offside, Seattle Reign. Allie Long tries a through ball, but Megan Rapinoe is caught offside. Attempt blocked. Rachel Daly (Houston Dash) left footed shot from the centre of the box is blocked. Assisted by Kealia Ohai. Substitution, Seattle Reign. Kristen McNabb replaces Beverly Yanez. Corner, Houston Dash. Conceded by Stephanie Catley. Attempt missed. Sofia Huerta (Houston Dash) right footed shot from outside the box misses to the left. Goal! Seattle Reign 3, Houston Dash 1. Allie Long (Seattle Reign) left footed shot from the centre of the box to the centre of the goal. Assisted by Megan Rapinoe with a through ball. Attempt missed. Nahomi Kawasumi (Seattle Reign) right footed shot from the right side of the box is close, but misses to the left. Assisted by Megan Rapinoe. Substitution, Seattle Reign. Jasmyne Spencer replaces Jodie Taylor. Offside, Houston Dash. Amber Brooks tries a through ball, but Kealia Ohai is caught offside. Offside, Seattle Reign. Lydia Williams tries a through ball, but Jodie Taylor is caught offside. Substitution, Houston Dash. Nichelle Prince replaces Kyah Simon. Offside, Houston Dash. Clare Polkinghorne tries a through ball, but Kealia Ohai is caught offside. Attempt saved. Kealia Ohai (Houston Dash) left footed shot from the left side of the box is saved in the centre of the goal. Assisted by Clare Polkinghorne. 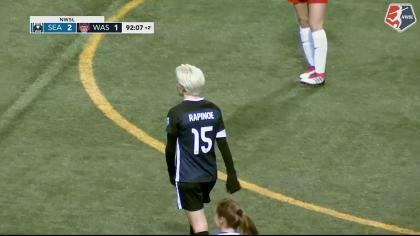 Megan Rapinoe (Seattle Reign) wins a free kick in the attacking half. Foul by Kyah Simon (Houston Dash). Attempt blocked. Megan Rapinoe (Seattle Reign) right footed shot from outside the box is blocked. Corner, Seattle Reign. Conceded by Jane Campbell. Attempt saved. Jodie Taylor (Seattle Reign) right footed shot from the left side of the box is saved in the top left corner. Assisted by Megan Rapinoe. Offside, Seattle Reign. Theresa Nielsen tries a through ball, but Jodie Taylor is caught offside. Attempt saved. Jodie Taylor (Seattle Reign) right footed shot from the centre of the box is saved in the centre of the goal. Substitution, Seattle Reign. Nahomi Kawasumi replaces Elizabeth Addo because of an injury. Delay in match Elizabeth Addo (Seattle Reign) because of an injury. Elizabeth Addo (Seattle Reign) wins a free kick in the defensive half. Attempt blocked. Clare Polkinghorne (Houston Dash) right footed shot from outside the box is blocked. Attempt saved. Rachel Daly (Houston Dash) right footed shot from the centre of the box is saved in the centre of the goal. Assisted by Clare Polkinghorne. Goal! Seattle Reign 2, Houston Dash 1. Megan Rapinoe (Seattle Reign) converts the penalty with a right footed shot to the top left corner. Penalty Seattle Reign. Elizabeth Addo draws a foul in the penalty area. Penalty conceded by Allysha Chapman (Houston Dash) after a foul in the penalty area. Offside, Seattle Reign. Megan Rapinoe tries a through ball, but Beverly Yanez is caught offside. Attempt saved. Megan Rapinoe (Seattle Reign) left footed shot from a difficult angle on the left is saved in the bottom left corner. Assisted by Megan Oyster. Attempt missed. 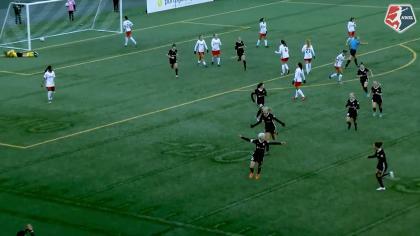 Rumi Utsugi (Seattle Reign) right footed shot from outside the box is too high. Assisted by Jodie Taylor. Attempt missed. Elizabeth Addo (Seattle Reign) right footed shot from the centre of the box is high and wide to the left. Attempt blocked. Theresa Nielsen (Seattle Reign) right footed shot from outside the box is blocked. Attempt saved. Jodie Taylor (Seattle Reign) left footed shot from the centre of the box is saved in the top left corner. Assisted by Elizabeth Addo. Second Half begins Seattle Reign 1, Houston Dash 1. First Half ends, Seattle Reign 1, Houston Dash 1. Corner, Seattle Reign. Conceded by Amber Brooks. Attempt missed. Beverly Yanez (Seattle Reign) left footed shot from the left side of the box misses to the left. Assisted by Megan Rapinoe. Foul by Sofia Huerta (Houston Dash). Attempt missed. Jodie Taylor (Seattle Reign) right footed shot from the centre of the box misses to the right. Assisted by Stephanie Catley with a cross. Attempt missed. Rachel Daly (Houston Dash) header from the centre of the box misses to the right. Assisted by Sofia Huerta with a cross following a set piece situation. Goal! Seattle Reign 1, Houston Dash 1. Jodie Taylor (Seattle Reign) left footed shot from the left side of the box to the top right corner. Assisted by Megan Rapinoe. Corner, Seattle Reign. Conceded by Kyah Simon. Attempt missed. Kealia Ohai (Houston Dash) right footed shot from the left side of the box is close, but misses to the right. Assisted by Kyah Simon. Stephanie Catley (Seattle Reign) wins a free kick on the left wing. Attempt missed. Kyah Simon (Houston Dash) right footed shot from more than 35 yards misses to the right. Assisted by Sofia Huerta. Offside, Houston Dash. Jane Campbell tries a through ball, but Rachel Daly is caught offside. Stephanie Catley (Seattle Reign) wins a free kick in the defensive half. Beverly Yanez (Seattle Reign) wins a free kick in the attacking half. Foul by Clare Polkinghorne (Houston Dash). Goal! Seattle Reign 0, Houston Dash 1. Amber Brooks (Houston Dash) header from the centre of the box to the top left corner. Assisted by Sofia Huerta with a cross following a corner. Corner, Houston Dash. Conceded by Lydia Williams. Attempt saved. Sofia Huerta (Houston Dash) right footed shot from long range on the right is saved in the top right corner. Offside, Seattle Reign. Megan Oyster tries a through ball, but Jodie Taylor is caught offside.